A podcast about all things Macintosh. For Mac geeks, by Mac geeks. Show 236. New iPhone ads spotlight App Store. MacBook Air Software Update 1.0 released. Apple looking to post a strong quarter. What is wrong with 3G? Rumors brew, possible Sept 9th iPod event? Psystar sues back. Bloomberg glitch kills Steve Jobs. Feedback to App Store and Apple comments from last show. Your Mac is smart, use it. Smart folders, playlists, and more. Phishing scams targeting more Mac owners. MobileMe not for all Me’s Review: Recorder for iPhone. iPhone Apps like rabbits in iTunes, cleaning up the dupes. Time Machine warnings can be confusing. iPhone lore: 9:42 AM. Keyboard navigation for Open Save dialogs. from Adam Christianson on Vimeo. As promised here is the video of Jonathan Coulton (jonathancoulton.com) performing Code Monkey during the Coverville 500 event in Las Vegas, Nevada during the 2008 New Media Expo. A podcast about all things Macintosh. For Mac geeks, by Mac geeks. A special episode of the Maccast recorded live from the show floor of the New Media Expo 2008 in Las Vegas, Nevada. This show features special guests Victor Cajiao (Typical Mac User) and Ken Ray (Mac OS Ken). Faronics Power Save Mac – Get a free trial. 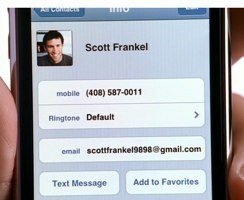 Is iPhone 3G’s Scott the new Jenny? Those of you who are old enough will maybe remember the 80’s hit Jenny by Tommy Tutone. The song repeated over and over again 8675309, the supposed phone number of a fictitious girl named Jenny. Back then the song drove anyone across the nation with that phone number nuts as they were overwhelmed by annoying random phone calls. Today, most movies, TV shows, songs, commercials, etc. use a “555” number to avoid this type of issue. So imagine how strange it was for me last night when I saw one of Apple’s latest iPhone 3G ads prominently featuring what looked like a legitimate phone number. 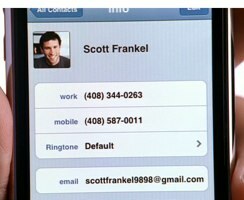 In the new Work Friendly ad for the iPhone 3G there is a point when they display a contact entry for Scott Frankel and right there in the middle of the screen is an actual (408) phone number. Two actually, because there is also a bad edit in the middle where the screen magically changes mid-shot and adds a second “office” number. After my initial shock wore off I began to wonder. Why would Apple use a “real” number in an iPhone ad? Was this simply a mistake by the ad agency? A clever marketing campaign? I could see by the zip code it was a Cupertino number, so was this a secret hotline into Apple’s headquarters? Well, any Mac geek can probably guess what I did next. Of course. I grabbed my own iPhone and started dialing. The first number, Scott’s “mobile”, simply had a call failure each time I tried it. The second “work” number went straight into a generic voicemail box. Now, I didn’t leave a message, but I have to wonder what would happen if you did. What is the point of all this? Is there a point? In the back of my mind I was kind of hoping this was a great viral marking scheme and the start of some cool iPhone/Apple treasure hunt like the kind of campaigns the folks over at Mac Heist have crafted in the past. But alas, it doesn’t appear to be so. Seems like a missed opportunity. Truth is, it’s probably just a prank on some poor unsuspecting intern who works at Apple. This guy is now wondering why he gets like 3,000 voice mails a day and why the folks in marketing snicker at him as he shuffles out of his cubicle each day to go have lunch. Maybe he should give Jenny a call and see if she’s available to join him? A podcast about all things Macintosh. For Mac geeks, by Mac geeks. Show 234. Next iPhone OS Update gets to developers. iPhone 3G starting to crack under pressure? Apple makes it easier to get your iPhone 3G. Mobile Me is finally fixed, maybe? AirPort Extreme Update 2008-002. Rumors of new Macbooks, chipsets, etc. iPhone ripples generating smartphone tsunami. iTunes 7.7.1 update. Leopard 10.5.5 shows up for developers. Apple finally patches DNS flaw, kind of. iPhone security using Wi-Fi. Finding and removing hidden files. Nullriver NetShare iPhone App. Removing 3rd party apps from sync list. Adjusting podcast auto delete settings. Flagging Mail.app email for follow-up. How-to disable iPhone backups.